The Hong Kong Polytechnic University (PolyU) has brought glory to Hong Kong by winning 9 prizes, namely the Grand Prize (overall championship), one Grand Award, three Special Gold Medals, and four Gold Medals, at the 46th International Exhibition of Inventions of Geneva. Covering a wide range of application areas, these breakthroughs not only expand the boundaries of knowledge, but also enhance the well-being of our society on different fronts. 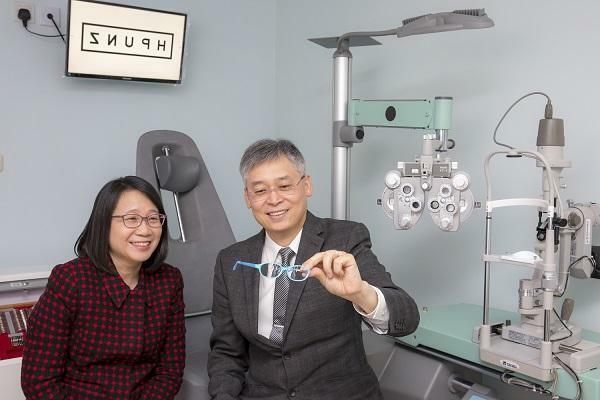 Among them, the Defocus Incorporated Multiple Segments (DIMS) Spectacle Lens for Myopia Control snatched the Grand Prize of the International Exhibition of Inventions of Geneva, Grand Award and Gold Medal with the Congratulations of Jury. "PolyU is committed to making the world a better place through research, innovation and knowledge transfer," remarked Dr Miranda Lou, Executive Vice President of PolyU. "These awards manifest the fruition of the tireless efforts of our research experts. We take great pride in their contribution in technological advancement, which doubtlessly deserves international recognition." The DIMS spectacle lens with multiple "micro-lens segments" projects myopic defocus and provides clear vision for the wearer simultaneously. It can slow down myopia progression in children by 60%, and 20% of the test subjects experienced no increase in myopia. The intelligent 3D imaging system with internal reflection unit can capture multiple angles of an object at the same time, generating a high-quality 3D image or video with depth map information after image processing. This novel textile can harvest ambient mechanical energy for electric power generation. It can be used as wearable power sources for portable and wearable devices, e.g. hearing aid, fitness tracker, wearable sensor, etc. The textile is super-flexible, tailorable, washable and can be fabricated by existing machines. Equipped with event sequence tracking, different kinds of remote sensing and imaging technologies, this system performs intelligent nighttime monitoring of dementia patients in a non-restraint approach. In case of unusual incident, the system will send an alert message to the caregiver immediately, expediting the incident handling process. PolyU will install over 100 units of eNightlog in local elderly health centres. The novel micro-embossing equipment with graphite-like carbon film can produce micron-level micro-structural optical components in glass using self-developed heating technology and innovative mould design. The equipment enables rapid and accurate impression of small aspheric lens and fine optical microstructures such as microlens array. The new breed of nanocomposites can be sprayed directly onto engineering structures, forming smart sensing network coatings for in-situ structural health monitoring and damage detection purposes. Due to its low fabrication cost, large quantities of sensors can be deployed in a sensor network, paving the way for a new era of structural health monitoring. The 46th International Exhibition of Inventions of Geneva, held from 11 to 15 April, has attracted 823 exhibitors from 40 countries/regions, showcasing around 1,000 new products. Under the patronage of the Swiss Federal Government, the State and the City of Geneva as well as the World Intellectual Property Organization, it is the biggest event of its kind globally. For more details, please refer to the event organizer's official website: http://www.inventions-geneva.ch.